The NAA is excited to curate a show of paper as an art medium. Paper, traditionally thought of as a surface, is revealed here as a medium to paste, cut, carve, and shape into as many forms as our eight imaginative artists can invent. The Art of Paper show runs Aug 23 - Sep 11. Using paper as a medium of expression has a long history. In Japan, the earliest unambiguous reference to a paper model is in a short poem by Ihara Saikaku in 1680 which mentions a traditional butterfly design used during Shinto weddings. We know this art form as Origami. More than a simple butterfly, today's artists have made folding paper into something magical. "Dating back to the 6th century, paper cutting originated in China as an affordable, practical form of folk art. In Chinese culture, paper cutting was most commonly completed in red and was used both for its decorative utility as well as its spiritual functions, promoting health and prosperity. Today's papercutting artists have taken the art to a new level. Collage, from the French: coller, is a technique of an art production, primarily used in the visual arts, where the artwork is made from an assemblage of different forms, thus creating a new whole. A collage may sometimes include magazine and newspaper clippings, ribbons, paint, bits of colored or handmade papers, portions of other artwork or texts, photographs and other found objects, glued to a piece of paper or canvas. The origins of collage can be traced back hundreds of years, but this technique made a dramatic reappearance in the early 20th century as an artform of novelty. Whether carving books, cutting them, folding their pages, or melting them. The art of using books or creating books is an art form that has no limits. The Fuller Craft Museum will dedicate a show to the art of the altered book through Nov 6, 2016. Not all paper art starts with a fresh sheet. Using recycled paper proves, what can be found in the waste basket, can take new form and purpose. The organization, Long Way Home, has for many years created the event Rubbish to Runway. 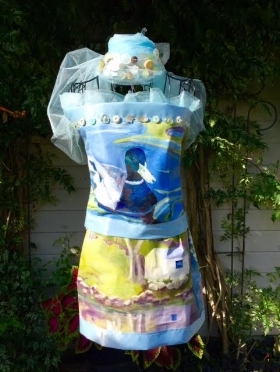 This very successful fashion show uses recycled materials to create wearable costume art. Papier-mâché, French for "chewed paper", is a composite material consisting of paper pieces or pulp, sometimes reinforced with textiles, bound with an adhesive, such as glue, starch, or wallpaper paste. Many artists have refined the process until it is nearly impossible to tell how their work is constructed. We are excited to present this art form to our community in a special show. If you are interested in digging deeper and viewing our artists's websites we have provided some links for you.